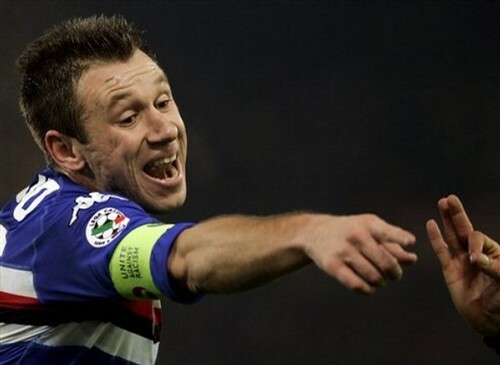 Inter To Take Cassano In January? Antonio Cassano’s future at Sampdoria can pretty much be called over after his recent dispute with the Blucechiarti’s president, Riccardo Garrone, with the fact that he has been frozen out from the squad the big question would be where would he go next? After Parma and Juventus reportedly considering the options to sign him next winter, rumors in Italy suggested that Inter Milan might also make a serious bid for the troublesome player. According to Tuttosport, Cassano has even made a personal deal with the Nerazzurri so that he will join Rafael Benitez’s side in the winter should his contract is indeed being rescind by Sampdoria. The claim seems to be a bold move although this kind of deal is not something new for Inter as they also snapped Goran Pandev last season in a rather similar way, which is getting a player who is in trouble with his club for free. Considering the fact that Inter seemed to be hampered with plenty of injuries that forced them to play plenty youngsters recently, getting a free quality player like Cassano would definitely fit their bill as the club will only need to pay for his wages. However, should the Italian international is signed there would be a little question on where would he play in Benitez’s formation as his positions seemed to crash with Wesley Sneijder. The possibility would be putting Cassano as a second striker in a 4-3-1-2 formation but that would take away one of Diego Milito or Samuel Eto’o, who have been the number one partnership in the team. Should Benitez sticked with his 4-2-3-1 formation, getting the former As Roma player would be wasteful as he isn’t that efecctive to play in the wing and surely won’t consider a bench spot should he failed in competing with Sneijder. Aside from the Nerazzurri, Juventus might also be a perfect place for the Italian international as the Bianconeri are currently looking for a striker albeit they needed a center forward type but since their coach, Luigi Del Neri, is open to the move the chance is still possible. Another club that reportedly had the biggest chance in getting the player is Parma that seemed to always ready in grabbing wasted talent just like they recently did in the summer with Sebastian Giovinco. Considering his attitude there seemed to be very low interest in big club’s management in signing Cassano, who didn’t actually had the best of spell with high profile teams. Although he seemed to cool down at Sampdoria but the recent bust up he had with Garrone, pretty much showed that the player is still a time bomb that could still cause an issue sometime in the future. So would Inter be the big team that are truly willing to gamble on the 28-years-old this time? The answer should be seen pretty soon when the January transfer window is open.